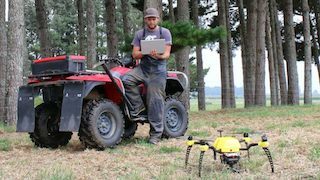 This comes off the back of a report last year by the Massey Business School, which examined the impact of cloud computing and other disruptive technologies on the agricultural sector. After interviewing technologists and agri-food producers, there was a wide gap in how these two groups perceived the industry into the future. Globally, there are 2.5 quintillion bytes of data created every day. Over 90% of the world's data has been created within the last two years. Technologies like the Internet of Things will dramatically increase these numbers. The problem is no longer about how to collect data - its how to get the right answers at the right time for the right purpose. The MobileTECH 2019 programme will be out in November, with the event running on 3-4 April 2019 in Rotorua, New Zealand. Further details can be found on the event website, www.mobiletech.events.